Wearing a white cassock and hood, and surrounded by a number of monks in black, Yacoub El-Maqary faces the camera. Smiling, the defrocked monk delivers his message: he declares himself patriarch and head of the Coptic Orthodox Church. The video was recorded at an unlicensed monastery in northern Egypt in early September; in the recording, Yacoub is surrounded by ten monks he had ordained himself, some looking down at the floor to avoid the camera. The recording of the message of renouncement came less than a month after the brutal murder of a prominent abbot at Abu Makar monastery, the former home of Yacoub. The abbot was allegedly killed by two of his own monks from his own monastery, and the brutal murder has caused consternation and disbelief among the Middle East’s largest Christian community. The white vestments worn by Yacoub in his video symbolise purity, although the self-proclaimed pope had been defrocked by the church hours before his announcement for establishing his unlicensed Anba Karas Monastery in Wadi Al-Natroun, and told to return to using his secular name, Shenouda Wahba Atallah. Once a monk at Abu Maqar, Yacoub/Shenouda’s defrocking is only one of a series of defrocking measures taken by Pope Tawadros in decisive actions since the murder at the monastery aiming to restore order to monasteries. But Yacoub/Shenouda’s incident, and the bishop’s murder, were not the only issues stirring the scene. Also in September, following El-Maqary’s unusual step, the Coptic Orthodox Church announced the death of a monk, identified as Zaynoun El-Maqary, after a "sudden health crisis”. Zaynoun had recently been transferred from Abu Maqar monastery to Deir El-Muharraq monastery in the Upper Egyptian governorate of Assiut. His monastic background and the reason behind the transfer to the new monastery by Pope Tawadros II were not provided by the church; however, several local media reports said that he had been the confessor priest of one of the defendants in the case of Bishop Epiphanius’s murder. The circumstances around the death of Zaynoun, which local media has speculated was a suicide, sparked more questions about the strange series of events that begun in a quiet monastery in July. At dawn on 29 July, Bishop Epiphanius headed from his private room in the ancient monastery to the monastery’s chapel for a Sunday prayer service. The 64-year-old bishop never completed the prayers; on his way to the church, an assailant hit him on the head with a metal rod, killing him. He was found shortly afterwards in a pool of his own blood. The news of the death spread quickly; the church, in its first statement on the matter, announced the bishop’s death without giving many details, but noting that it took place in “strange circumstances”. The brutal murder left Egypt’s large Coptic community distraught, and incited bewilderment and confusion. While the community awaited answers, Pope Tawadros II was looking into a manoeuvre to put the Coptic Orthodox Church in control and preserve the community which has been heavily targeted by terrorist groups over the past few years. Epiphanius’ death prompted the church’s Holy Synod to issue 12 decrees that would change monastic life, including a temporary freeze on new recruits, a ban on monks leaving monastery grounds without permission, and restrictions on monks’ use of social networks and their media appearances. The decisions were not limited to the decrees; the pope ordered the defrocking of two of the monastery’s monks, Isaiah El-Maqary and Faltaous El-Maqary, over long-standing violations which were unbecoming of a monk; both men would later be charged with the murder of the bishop. The defrocking of the monks was a decision that was not related to the murder of the abbot, according to the Coptic Orthodox Church; however Pope Tawadros’s words in a sermon which followed suggested otherwise. “Satanic wars throughout the history of monasticism are many and throughout history there have been monks who have fallen, for no one is above sin,” the pope said at one of his weekly sermons after the new decrees, bringing the public closer to pointing fingers at the two recently defrocked monks. “Judas offers an example of betrayal as its peak. In every society a Judas will always appear, but rather, I tell you that in every twelve a Judas will appear,” he continued, leaving the public to put the pieces of the puzzle in place. A few days after the sermon, Egyptian prosecutors detained the two men on charges of killing the abbot, referring them to criminal court for a trial which begun on 23 September. Ahead of their trial, speculations over doctrinal conflicts, financial disputes, and even a scandal involving the two main men surfaced. According to state investigations, the two men plotted to kill the bishop one month before the act took place, and were motivated by personal grudges against him. The nature of the conflicts were not made public by the prosecutors or the church; however, several media outlets reported that the bishop was facing opposition lead by Isaiah inside his monastery walls prior to the murder, with a previous attempt by the abbot to remove him from the monastery, only to be cancelled after a petition signed by many monks asked for him to be given a second chance. Analysts believe the gruesome murder, while important, is not the catalyst for the current conflict within the Coptic church, but instead the reactions to the death are merely the latest manifestation of the deep crisis the church is undergoing. “After more than 40 years under the leadership of Pope Shenouda, who was a larger than life figure and who imprinted his vision on the church, it is only natural that the period after his death would witness some turmoil as contending visions, long suppressed, come to the forefront again, and a new pope seeks to fill the vacuum left by his predecessor,” Samuel Tadros, an expert on the Coptic church at the Hudson Institute in Washington told Ahram Online. “In the age of social media, it is no longer possible to hide those disagreements,” he said. Pope Tawadros’s reactions to the incident have been seen as decisive and unprecedented, according to experts. “The pope’s reaction, after the initial shock of the murder, has been very swift and decisive. He has not sought to hide the facts out of fear that they may harm the image of the church or monasticism. Instead he has made it clear that the church will not interfere in the investigation and will accept its results. Moreover, he has immediately moved forward with necessary steps to bring the state of monasticism back to order,” Tadros said. 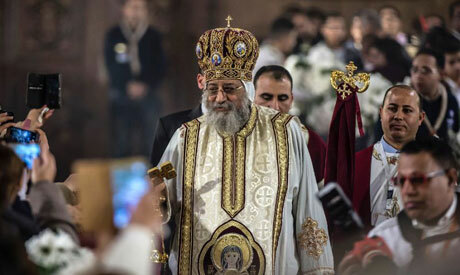 Ahram Online tried to reach out to Archbishop Armea, general bishop and president of the Coptic Orthodox Cultural Centre, to clarify the church's next steps, but was unable to get a response. In modern times, the church has often been accused of hiding facts from the public in cooperation with the state in incidents involving Copts, in attempts to contain them, especially when the crisis might involve a risk of sectarian strife. A state interference in the church is viewed by Tadros as one with two “contending visions”. “There is a view that a weak papacy is a good thing and that the state should encourage these divisions as they allow them to control and interfere in church affairs,” he said, however adding that Pope Tawadros II is held in high regard by the state, so there are some who would view weakening him as dangerous for the state, especially because they desperately need him to control Copts abroad. Ahead of the murder over the summer, most Egyptians knew little about the ancient monastery in the desert. Located in Wadi El Natroun, in Beheira governorate, 92km north-west of Cairo, and off the highway between Cairo and Alexandria, the monastery was established on 2,700 acres, with only four acres as the actual area of the monastery and attached buildings, while the rest allocated to fields and gardens. Since its foundation in the fourth century, Abu Maqar monastery has been continuously inhabited by monks. Several Christian saints and fathers of the early church were monks at the Monastery such, as its founder Saint Macarius of Alexandria (Abu Maqar), Saint John the Dwarf, Saint Isidore, Saint Paphnutius the Ascetic, Saint Moses the Black, Saint Arsenius, Saint Serapion, Saint Poemen, and many other monks up to the present. In the modern era, the monastery's name was linked to one of the most famous Coptic Christian reformists and thinkers, the monk Father Matta El-Maskeen or "Matthew the Poor”. In 1969, the monastery entered an era of restoration, both spiritually and architecturally, with the arrival of 12 monks under the spiritual leadership of Father Matta. These monks had spent the previous 10 years living together entirely isolated from the outside world, in the desert caves of Wadi El-Rayyan, about 50 kilometres south of Fayoum, gaining distinctive spiritual experience which travelled with them to Abu Maqar monastery. When the 12 monks moved to Abu Maqar in 1969, the monastery started to gain special attention and significance among Christians and clergymen as a home for a new, reformist school of thought within the Christian dogma. It was not too long until an old theological Christian dispute from the 1950s between the followers of Father Matta’s ideological school and Pope Cyril VI emerged again, this time between Pope Shenouda III, who became head of the church in 1971 after the death of Pope Cyril. The monastery gained rising attention in the following decades as Father Matta resided there. The popularity of Father Matta rose among Christian public, leading what was described by his supporters as “reformative ideologies” inside the church. Over the years, the pope criticised some of the ideas of Father Matta; however, until the latter’s death, there were no charges of him abandoning the teachings of the church. During a political dispute between President Sadat and Pope Shenouda III during the 1970s , Father Matta met with the late president several times, triggering another disagreement between the pope and the monk, in addition to the other disagreement on religious and theological issues that extended to accusing Father Matta and his followers of school of thoughts of corrupting Christian doctrine. The tense relation between the pope and the monk continued over the years, with discussions between the followers of both schools who rejected each other’s ideas on certain Christian dogmatic issues. In 1996, Pope Shenouda visited the monastery for the first time and met with Father Matta. The visit was described as "historic' as the two men exchanged greetings, and later on the visit was followed by other meetings between the two religious figures. Despite the visit, the disagreement between the pope and Father Matta remained, one with a vision that emphasised social work and another one focused on spiritual revival. The ideological conflict became quite public over certain religious differences on Father Matta’s writings on theosis/deification, rejection of original sin, rejection of biblical literalism and many other views which Pope Shenouda found offensive. In an interview with Al-Ahram newspaper after the visit, Pope Shenouda said "I never knew that Father Matta was sick and didn’t call or even visit him; however, maintaining good social relations is something and the dogmatic differences remain a different matter." Father Matta died in 2006, but his ideas and thought created a generation of followers, especially among the monks in his monastery. The monastery remained without a spiritual leader until 2013, under the supervision of Assiut’s Bishop Mikhail. In this period, several disputes erupted inside the monastery between Matta’s followers and those of Pope Shenouda. Pope Shenouda visited the monastery again in 2009 and met with the monks. During this visit, the pope was acclaimed as the direct supervisor of the monastery and “the father of all monks”. He instructed the monks to wear the monastic hood, which had been rejected by Father Matta for many years. In 2013, Pope Tawadros, who succeeded Pope Shenouda, nominated three monks to head the monastery, among them Bishop Epiphanius, who went on to win the nomination and head the monastery. Bishop Epiphanius was a spiritual student of Father Matta, and won the votes of the monks who followed him. Based on the results of the elections, Pope Tawadros decided to ordain the bishop as the head of the monastery, tasking him with easing the ideological dispute in the monastery and bringing its monks together. The trial of his alleged murderers will continue to make headlines, and to uncover the rivalries and hidden conflicts within the church. For Copts, the episode has been disheartening. “Copts will be hugely disappointed as the details of the murder and the behaviour of the two accused is fleshed out during the trial. Copts hold monasticism in very high regard. We grow up with the stories of the early monks like St. Anthony the Great and St. Macarius and Copts are about to discover the reality that while their likes do exist, monasteries are also full of monks who do not rise to that standard. In a sense, they are about to be shocked to discover that monks are human after all,” said Tadros.